I was having severe HAIR FALL since few months so I tried many hair fall shampoos including Tresemme Hair Fall Defense Shampoo and this Loreal Fall Repair one. I was quite attracted by its beautiful big packaging in black like most Loreal products and moreover I heard some good reviews about this range so just picked up the biggest bottle in the size and have been using it for 2 months and here is my review on this. Your hair is stronger from root to tip. Massage gently into wet scalp/hair, lather. Then rinse. PRICE: Rs 389/- for 640 ml. This anti hair fall shampoo comes in beautiful black packaging and what's great is that the biggest size comes in a bottle with pump dispenser. I simply love products with pump dispensers since they are so easy to use and convenient, free from the hassle of opening the flip again and again if you require more amount of product. Though this one is definitely not travel friendly being extremely heavy but this comes in many different sizes so one can go for the smallest to get the travel friendly packaging. Take a look at this big bottle below. The shampoo is of the medium consistency, a little towards thinner side with a nice fruity fragrance. Though the fragrance is bit strong but I totally love shampoos with fruity touch since they give you such a refreshing bath feel and also the fragrance lingers on for sometime. The shampoo lathers extremely well giving you a squeaky clean hair free of all dirt and oil. Along with the shampoo I also use L'oreal Paris Fall Repair 3x Anti-Hair Fall Conditioner Review, which makes hair smooth and manageable because without the conditioner the hair feel somewhat dry. But I take care to use very little conditioner because using shampoo alone builds up oil on the scalp on the third day so use of excessive conditioner would result in total flat weigh down hair. 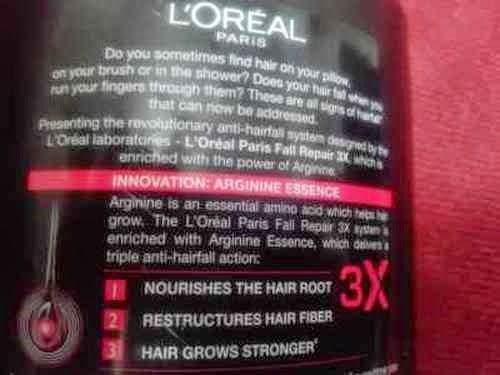 Now coming to its effectiveness of the shampoo in controlling hair fall. 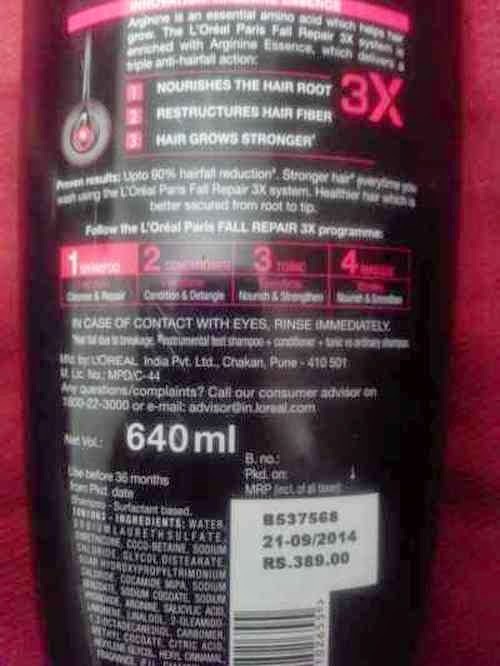 Well this Anti Hair Fall Shampoo definitely controls hair fall to a noticeable point. I remember I use to take big bunch of my falling hair after shampoo while detangling, which got reduced to a huge extent in just few washes and very less after a months usage. Shampoo frequency being 2-3 times in a week. This was the good part, now let me tell me you the bad part. 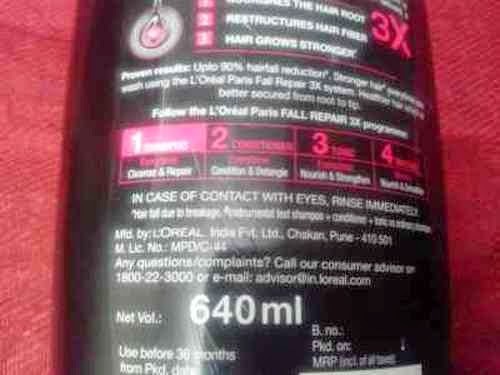 The hair fall control is definitely not a permanent solution from this shampoo. The hair starts falling off again once you switch to other shampoo. I remember I started using Tresemme Keratin Smooth Shampoo & Conditioner and after about a week, there was again hair fall. I think there is some ingredient in this which keeps hair free from tangles and breakage thus preventing hair loss. Also I font want to use this shampoo for long since this contains so many chemicals and I always look for a SLS FREE SHAMPOO in long term. Over I think this is a good shampoo for someone with moderate hair fall and dry scalp but one needs to use a proper conditioner with the s to make hair more manageable. But yes those who have hair fall problems since years and are looking for a permanent solution, then you won't be much satisfied with the results. Comes in beautiful bottle with dispenser. Lathers well with just little amount. Use with conditioner makes detangling of hair super easy. Refreshing fruity fragrance lingers on hair for dome while. Controls hair fall as claimed. Noticeable reduction in hair fall after few washes. Easily available in lot of different sizes. Contains SLS and other lot of ingredients. Oil build up on the third day if shampoo. Hair fall starts again when switch to other shampoo. Love the pimp dispenser bottle, This sounds to be an okay okay product to me.